Food is certainly delicious, but it’s also vulnerable. Packaged improperly, food can spoil, lose its integrity and—worst of all—its flavor. That’s why it’s key to choose the right type of packaging material that’ll eventually be in full contact with your food products. So, let’s take a good look at some food packaging paper options and what they’re best used for. Pay attention, there’s a test after. Just kidding. A cost-effective option for wrapping and packing meats, butcher paper is widely used by butchers, delis, food stalls and farmers markets. Its moisture protection is adequate but meant for temporary or time-sensitive use (it’s more prone to soak through). It’s also used as a surface cover, protecting butcher blocks, stainless steel counters and restaurant tables. Butcher paper is available in both rolls (best for bulk and high-volume use) and sheets (best for quick access and high turnover). White paper is cleaner in appearance and used for presentation purposes. Kraft paper is more prevalent, used for wrapping steaks and chops at deli counters (and what you’re more likely to see in TV shows and commercials). And, like all the food packaging paper in this blog, butcher paper is food grade and FDA compliant. 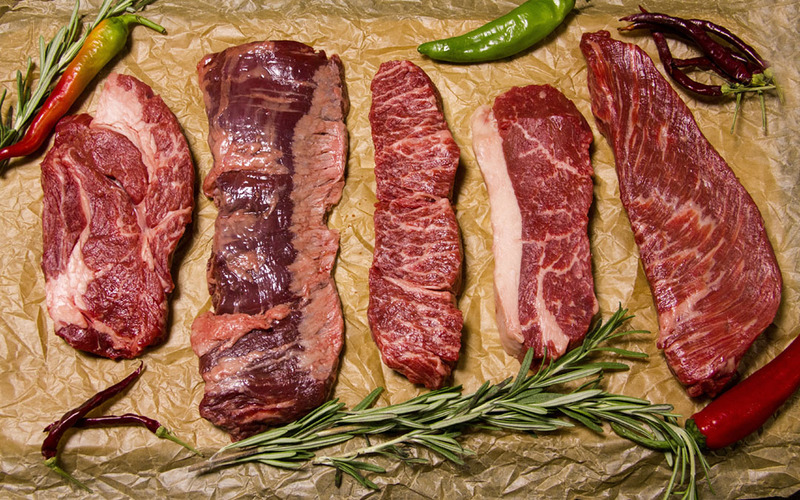 Cut thicker during manufacturing, steak paper is a heavier food packaging paper option. It resists staining, prevents juices from soaking through the paper, and acts as a barrier against air and dirt exposure. It’s also used to line trays and separate layers of meat, making it ideal for retail display (both on counters and inside glass showcases). When using steak paper (and any of the food packaging paper in this blog) in a roll format, consider investing in a matching paper cutter. It’ll speed up your packing times and reduce packaging waste. Often coated in soybean or paraffin wax, this kind of deli paper is non-stick and moisture-resistant. It keeps food juicy and moist, while preventing crunchy foods from getting soggy. The waxy layer also prevents water, grease, fat and oil from soaking through the paper. That same waxy layer means it’s not safe for putting in the over, however. Non-abrasive and food grade, it’s ideal for surface protection, interleaving products and keeping prepared or assembled food items intact. When used properly to protect against contamination, freezer paper can protect food products against freezer burn for up to a year. Often bleached white for a clean and hygienic look, one side is coated with polyethylene to create a barrier that keeps moisture, air and other frozen food products at bay. Together, these properties help freezer paper remain strong and intact even once it becomes wet. Usually coated in silicone or Quilon, parchment paper is a non-stick and heat-resistant food packaging paper. That makes it a popular choice for use in kitchen food prep and for lining trays used in cooking baked goods. Quilon-coated paper is a single use parchment paper meant for average range oven temperatures, while silicone-coated paper can be used multiple times at higher baking temperatures. In addition to being food grade and FDA compliant, most parchment paper is Kosher as well. Just like waxed bags and glassine bags, it’s important to know the differences between the various types of food packaging paper. Some are meant for temporary protection, others for long-term storage, and some will help keep your kitchen from becoming a big, smoky mess. For other food packaging products like foil wrappers and food bags, be sure to stick with The Packaging Company.